The Eagles are finally getting some good news on the injury situation. Wide receiver Jeremy Maclin and cornerback Asante Samuel practiced yesterday and today at Leigh. left knee after the team originally diagnosed him with a hyperextended knee. Impressively, Maclin was on the practice field running routes without a brace and sleeve on the left knee. 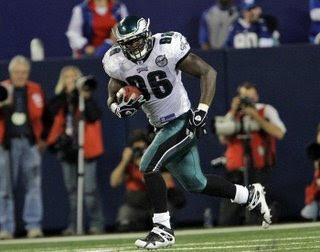 Of course, he was not able to do all the drills, but considering just a couple of nights ago at the Eagles' Flight Night the starting wide receivers were Hank Baskett and Jason Avant, the Eagles will gladly welcome him back. It also marks the first time since the start of contact drills that the Eagles have their starting dynamic wide receiver tandem on the field. This could be a reason that Kevin Kolb has struggled over the past couple of days. Just as significant, starting cornerback Samuel participated during Saturday’s afternoon practice and this morning's workout. As everyone knows, Samuel has been out with a hamstring strain. While he was still limited at practice, he allows the Eagles to move Joselio Hanson back to his natural corner position on the inside. Everyone take a deep sigh of relief. Backup tight end Cornelius Ingram was held out of practice not due to an injury he sustained in practice. In fact, the Eagles gave him the morning session off to rest his surgically repaired (twice actually). However, it is a shame for the fans that went up to Leigh and were expected to see him and Clayton Harbor compete for the second-string tight end job. Before given the practice off, Ingram appeared to be gaining confidence in his knee and starting to make a strong push for the job. If Ingram plays like he did pre-ACL injuries then he gives the Eagles a giant boost in the red zone. He possesses great size, hands and speed, which enables him a very difficult matchup when the field gets smaller. Furthermore, he allows offensive coordinator Marty Mornhinweg to run two-tight end formations, which is something that has been missing from the playbook for quite sometime. *LB Omar Gaither sat out practice with a sore ankle. It is not considered serious, but with rookie Jamar Chaney vying for his job, it is beneficial for him to come back soon. *RB Mike Bell sat out most of practice, but did participate in the non-contact drills. For Bell, he is leaving the door open for Charles Scott and J.J. Arrington to take over for the No. 2 running back position. * A.Q. Shipley's chances to make the 53-man roster might be dwindling by each passing day. He sat out most of practice like Bell. Shipley has a great opportunity to make the team with Nick Cole and Jamaal Jackson out. However, he cannot make the roster by sitting on the sidelines. * Two rookies in Ricky Sapp and Keenan Clayton missed practice again. Sapp is out due to his knee. Meanwhile Clayton missed due to an undisclosed personal reason. * DT Antonio Dixon missed another day of practice due to the concussion he sustained. CB Macho Harris is still recovering from a hamstring stain. * The highlight and miraculous play of the day was Asante Samuel nailing backup running back Eldra Buckley. Unfortunately for Samuel, the hit did not result in a tackle and Buckley kept on trucking. Still it is good to see Samuel attempting to make a tackle because last year teams attacked him with screens due to his porous tackle (or if you want to call it lack of effort). As for Buckley, he is not getting the pub that Charles Scott and J.J. Arrington, but he might make the team due to his special teams ability. Additionally, he has made a nice impression once the pads have come on. * More good news on the running game. 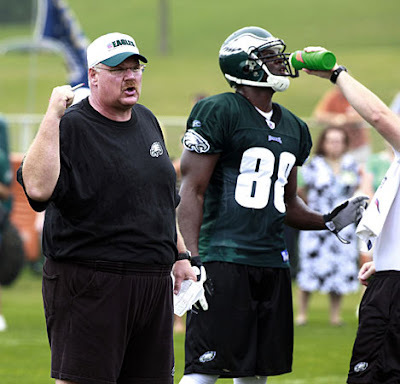 The Eagles devoted a majority of their practice towards running the football. This is something that will be needed in order for Kevin Kolb to succeed in his first year as the starter. * Rookie seventh-round pick Kurt Coleman continues to make plays when he is out there. Today, he stripped starting tight end Brent Celek and made some nice plays in coverage. At the time Coleman was draft, he was projected as a big-time sleeper. With Quintin Mikell turning 30 soon and his contract up at the end of the year, Coleman could be the Eagles starting strong safety next year. * For the first time all camp, DE Darryl Tapp made an impression. Tapp was put on the first unit defense and recorded a sack against left tackle Jason Peters. 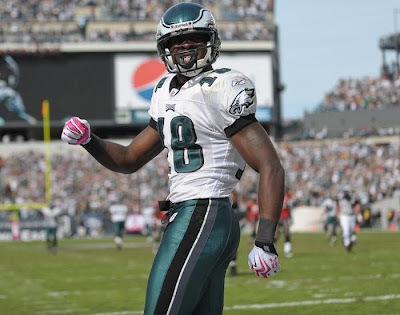 Hopefully, Tapp continues to get comfortable and shows why the Eagles traded for him. However it should be noted that Brandon Graham was lined up with him and helped create that opportunity. * WR DeSean Jackson showed why he is the No. 1 playmaker on the Eagles. He managed to get open while being covered by rookie safety Nate Allen in one-on-one drills (actually had good coverage, but it is nearly impossible to cover Jackson one-on-one especially as a rookie). Again, Jackson has shown no side effects since coming back form his back spasms. He could really be the key to Kolb's success this year. His ability to stretch defenses and get double-teams will enable Maclin, Celek, Ingram and Avant to receiving single coverage and for Kolb to pick apart defenses because of that. * Undrafted rookie tackle Austin Howard is going to give King Dunlap a run for his money for the backup tackle position. The 6-foot-7, 333-pounder has shown quick feet and a nice display of power. In fact, he destroyed Trent Cole in practice today. On the flip side, Dunlap has been non-existent. He appears to make the same mistakes he did as a rookie and has not improved. This was one of the reasons that Dunlap fell all the way to the seventh round. He has second round talent, but is just lazy. * Lastly, ESPN's Adam Schefter was at Eagles camp today. He has been doing his bus tour of training camps. Schefter seemed to be surprised at what he saw at Eagles camp. He tweeted, "Eagles are hitting -- blowing up people -- unlike any team I've seen in camp this summer." Here is a link to his postcard.